Alexander Kunz is group managerTruServices at Trumpf Inc., Farmington, CT: 734/454-7200, www.trumpf.com. Service is a valuable component of business, particularly when it relates to the add-on or after-sales services required once a machine has been installed. Machine-tool providers understand the value of keeping services to a minimum while providing superior performance. Such services enable sheetmetal fabricators to best maintain a fleet of fabricating equipment that runs with maximum uptime at minimum cost. To that end, machine-tool suppliers strive to provide highly productive solutions, rather than just pieces of equipment that perform a function. 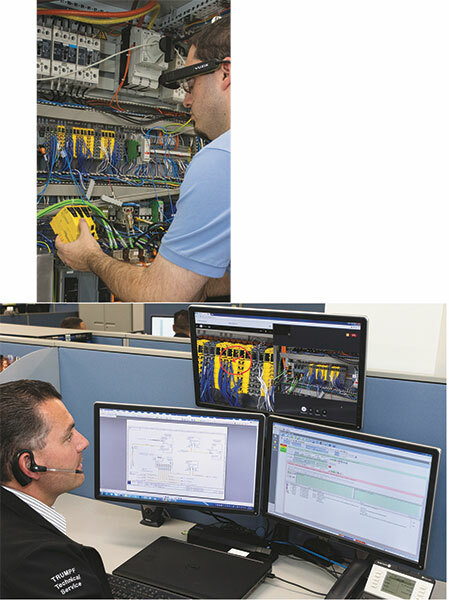 Remote service technology leverages mobile communication between the technician and the technical-service professional. Via hands-free “smart” glasses worn by the technician, he can share live, annotated images and videos (top screen of the photo to the right), engage in dialogue, and receive instruction. Since fabricators rely on service to keep their machine tools operating at peak performance, the quality and breadth of these support services have become critically important and often a differentiating factor. This includes the training of service technicians and the development of new solutions to quicken response times and improve machine diagnostics, as well as the increased use of remote troubleshooting. In the end, all of this leads to more efficient service. One example: Integrated sensors within the slat cleaner of a laser-cutting machine. Here, this special power tool designed to clean the machine’s slats communicates with an online system to notify users when maintenance is required. Although the monitoring technology is fairly straightforward, fabricators can realize substantial benefits. Further, in laser cutting new technologies such as smart-nozzle automation can ensure process reliability in addition to alerting the user when maintenance is required. A camera system with integrated sensors automatically inspects the cutting lens and nozzle during machine operation. Using this information, the user can continually monitor consumable status and schedule cleaning or replacement. Innovations such as these contribute to lean-manufacturing initiatives by increasing efficiency throughout the shop. By this point, most fabricators have embraced lean manufacturing as a worthwhile endeavor and recognize its role in increasing efficiency and productivity for lower operating costs and greater flexibility. Applying lean principles to service offerings has led to increased use of preventive maintenance (PM), seeking to avoid unplanned downtime through regular performance and maintenance sessions. A recent survey of fabricators finds that machines covered by PM plans, compared to those not covered, require 20 to 30 percent fewer spare parts and repairs; will run with higher uptime; and will have a higher resale value. The real value of PM is realized, however, when the technician can apply experience and training to identify potential problems before they arise, and then schedule the least-disruptive fix to minimize machine downtime. Soon, service concepts will take PM to the next level, allowing fabricators to identify concerns without relying on the keen eye of a service technician during a scheduled plant visit. It already is possible to predict potential failures by using machine data gathered by sensors, software and other technologies. But as machine connectivity continues to increase, manufacturers will be able to derive even more data from a larger pool of machines. With this data comes statistical relevance that can be used to identify signals of impending problems. And, with these types of predictive-maintenance solutions in place, a metal fabricator no longer will have to request emergency support when faced with a downed machine. Instead, a service technician will proactively contact the user if, for example, a machine part is projected to fail. This new approach will reduce costs and avoid frustration and wasted time. While exciting, the ability to reduce operating costs through predictive-maintenance data requires machine-tool manufacturers to be fully committed to enhancing their service offerings. One enabler: Industry 4.0 solutions that take advantage of the increased interconnectivity of machines and systems. Such solutions will become increasingly essential for sheetmetal fabricators seeking to eliminate inefficiencies. For example, consider remote service technology that leverages mobile, visual two-way communication. Here, standard mobile devices, such as hands-free “smart” glasses worn by a remote service technician, enhance communication with trained service professionals. These solutions deliver a high level of technical service more quickly than ever, and empower customers to become more independent as they grow their own expertise. Using the glasses, the technician shares live annotated images and videos, engages in dialogue, and receives instruction from the service professional. This superior service is provided instantly and at a significantly reduced cost, which makes repairs quicker and less expensive to perform, diminishing unplanned downtime. …leads to innovations that enable fabricators to achieve the greatest return on their capital investments, now and in the future. From analyzing big data to taking greater advantage of the interconnected technologies on the shop floor, new solutions remain on the horizon. The goal: Allow customers to run independently and at a 100-percent-lean efficiency level.